Avoiding contamination of employees during cleaning and dust extraction operations is an important issue for pharmaceutical companies. 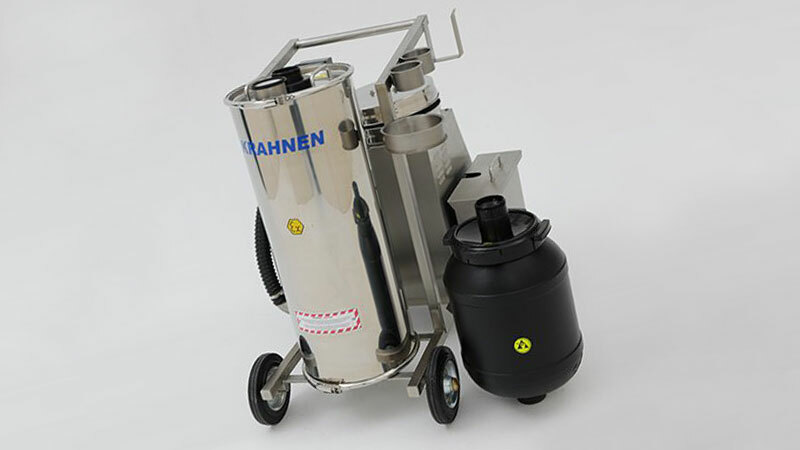 Using conductive CurTec drums, Krahnen has developed a special cartridge for their high-end ATEX vacuum cleaners that collects dust and can be easily disposed of without the risk of contaminating operators or their environment. Cleaning and dust extraction operations are daily business in many pharmaceutical and chemical companies which manufacture or handle powders. The powders in question are often toxic, hazardous and/or explosive and need to be extracted without contaminating/ jeopardizing employees or their surroundings. Over the years, the safety and security requirements of these industries have evolved and companies require equipment that is reliable and secure. Krahnen is a German manufacturer of cleaning technology for hazardous areas in various industries. They offer a full range of high end industrial cleaning systems such as (safety) gas and dust vacuum cleaners, floor cleaning machines and central extraction systems. Products are developed and built in house by quality engineers and meet the highest safety and security standards. A good example of their craftsmanship are the ATEX vacuum cleaners, which have a dust disposal system that is particularly reliable and safe to operate. It involves a cartridge, made of a 26 liter conductive CurTec drum, which contains a filter bag. The screw lid drum is made of conductive plastic and is safe for storing explosive free flowing solids. Krahnen mounted two connecting pieces with self-closing valves to the screw lid and the base of the drum. After use, the drum/ cartridge can be lifted from the vacuum cleaner and disposed of without any contamination risk whatsoever. The biggest benefit of CurTec drums is being conductive (with a surface resistance of ≤ 1,000,000 Ohm) instead of antistatic. Antistatic surface values are often achieved with an additive, which diffuses from plastic over time, lowering its conductive properties and increasing the risk of ignition by sparks. 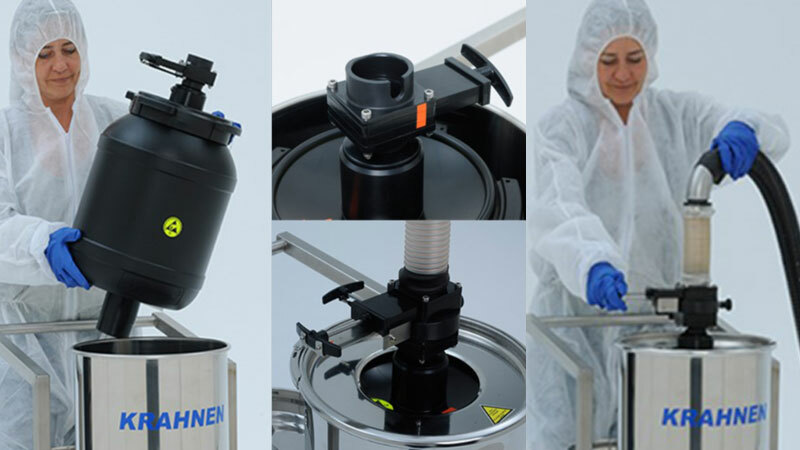 Other benefits are the diameters of the drums, which are ideal for fitting existing ATEX vacuum cleaners, the wide range of capacities available for customization into conductive (at relatively minimum order quantities), and the fact that CurTec offers pharma compliance, which is requested by Krahnen’s customers. Quality management and process safety have evolved over the years, especially in the pharmaceutical and chemical industry. Due to the increasing requirements of their customers, Krahnen has taken quality to a higher level and with their performance products they are able to meet the strict safety regulations in place to protect operating staff and their surroundings. Risk reduction and quality compliance are two goals to which also CurTec is strongly committed. They are a GMP certified production facility and they offer regulatory compliance, which allows their packaging to make a valuable contribution to any supply chain.